It is believed that through spiritual meditation it may be possible to further and further detach consciousness from the body, thereby reducing the impact of pain. This can encourage all kinds of spiritual showmanship, such as the placing of needles through flesh and walking on hot coals (both of which have been dismissed by Western doubters as painless pursuits when done properly) and more extreme practices such as starving oneself. It must be pointed out that showmanship of this kind is not a desirable element of spiritual enlightenment, and it is certainly not necessary to martyr oneself in order to attain a state of peace! However, for those who wish to use meditation as a means to help relieve pain, they may be comforted to know that as both Western science and spiritual groups see the mind and body as interconnected, it naturally follows that developing a relaxed mental or spiritual state will contribute to physical wellbeing. A study published in the NeuroReport journal in August 2006 found that people who regularly practice Transcendental Meditation (see related article: Transcendental meditation) show a 40-50% recordable reduction in their brain's negative response to pain. This accords with a modification of the brains functions, thus reducing stress, increasing confidence and reducing the upset caused by minor to acute pain. This information could possibly be treated with caution in light of the fact that Transcendental Meditation - or TM - is a system that one must pay thousands of dollars to learn; therefore all research suggesting its effectiveness must be carefully screened in order to ensure its non bias. However, as TM does not differ greatly from other forms of meditation, it could also be taken that the accuracy of this information would imply that all meditation can help to tackle pain in a similar way, though many have not been as vigorously tested as TM has in the U.S, presumably because they are not as lucrative as TM. Both yoga and meditation, in its simplest sense, are taken to be useful for reducing pain and are often prescribed to reduce the near constant pain caused by cancer, as it is believed beyond doubt that relaxation can help one cope with physical discomfort, although it must be cautioned that powerful pain killers are also necessary for dealing with the pain caused by Cancer. It is felt widely that these forms of relaxation are particularly useful for dealing with pain that is not specific to an injury or ailment. Stress symptoms such as muscular pain and migraine are two such examples of pain that can be reduced and even avoided by meditation. Regular meditation undoubtedly provides relief for pain sufferers, whilst prolonged meditation is an effective means of preventing the build up of both stress and physical ailments. 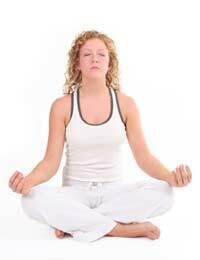 For further advice it is worth consulting your General Practitioner, most of which can now point you in the right direction if you want to begin meditation. It is sometimes cautioned that persons with psychological problems should steer clear of meditation as it can actually have an adverse effect on people suffering from forms psychosis. It is worth checking with your Doctor first if you feel at risk, though this is a purely western view: Many Eastern thinkers believe that the adverse mental effects sometimes experienced during meditation are just part of the process leading to Enlightenment. The main thing, above all, is to feel comfortable that what you are doing is right for you and seek the advice of experienced people that you trust if you are unsure.